Check out our range of Wacker Neuson Compaction Equipment. Vibratory Rammers, vibratory plates and rollers. Check out our range of Wacker Neuson Concrete Technology. Internal vibrators, external vibrators, frequency converters, trowels, vibratory screeds and rebar tier. 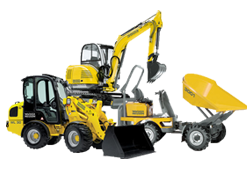 Check out our range of Wacker Neuson Compact Equipment and machinery for sites. Excavators, skid steer loaders, dumpers, wheel loaders and telehandlers. Check out our range of Wacker Neuson Worksite Technology. Breakers, cutting devices, generators, pumps, lighting, air dehumidifiers and heaters.